Hello and happy wine Wednesday to you! I hope your week is going well. It has been an interesting one for me as David headed south to Colorado to ski 12 mountains in 14 days. He said the skiing is exceptional and they are having record conditions! Yay! Last night we covered the Rhône region of France which is the second largest producer of AOC wine after Bordeaux. Northern Rhône is located just below Lyon and starts in the town of Vienne. The Southern Rhône vineyard area runs from Montélimar to Nimes. Interestingly, the Northern Rhône accounts only for 4% of the entire production in the Rhône valley with Southern Rhône making up the lions share! This region is located further south in France so the production is predominately red. In Northern Rhône, the wines are usually dry reds from the Syrah grape and the whites are made from Viognier, Marsanne and Roussanne. There is hardly any Northern Rhône wine in our market place – they are harder to find and more expensive than their southern cousins. The vineyard slopes are some of the steepest in the world with 60° inclines! The Rhône river plays a big role in the vineyard region here as it moderates temperatures and helps protect the vine from autumn frosts. The Southern Rhône wines are usually blends as they can grow 27 grape varieties and produce dry white, sweet fortified white, dry still rosé, dry red and sweet fortified red wines…can you say variety! The Mistral wind can hugely effect this area with winds blowing anywhere up to 100 KM. Both Northern and Southern Rhône have 8 Crus and we were lucky to sample some Cru AOCs last night. 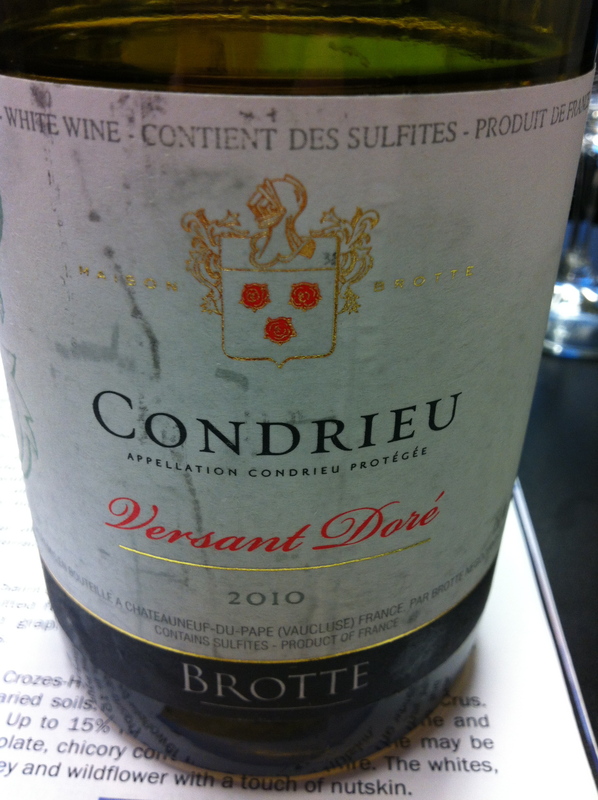 Brotte Versant Doré Condrieu AOC 2010 $60 This 100% Viognier was my favourite of the evening. This is a highly textured wine with loads of apricot and floral notes. It has medium plus body with medium acidity. Pair with lobster or scallops. Delish. 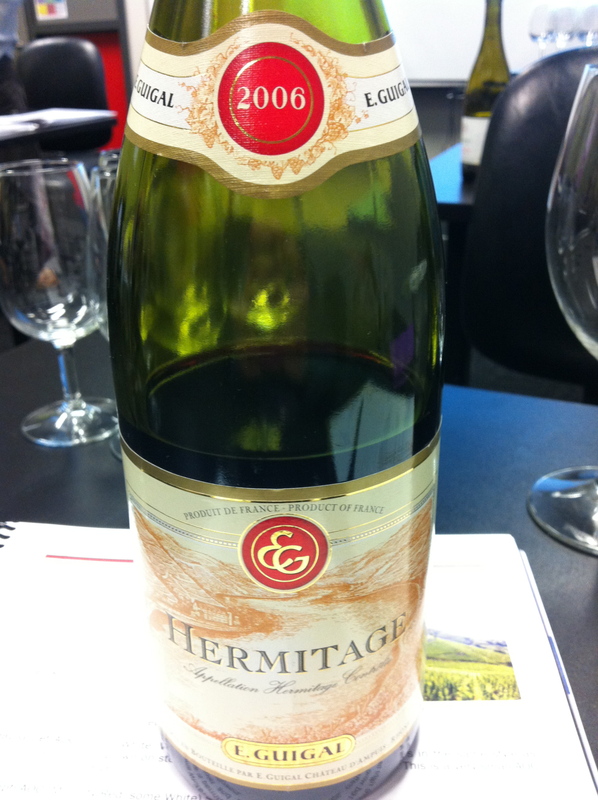 E. Guigal Hermitage AOC 2006 $90 This is a 100% Syrah bottle of wine that, in my opinion, was worth every penny. It still had a nice amount of freshness to it after seven years of aging and it still has more to go. Beautiful flavour profile. Domaine Font De Michelle Châteauneuf-du-Pape AOC 2009 $52 This wine, a white Châteauneuf-du-Pape that you don’t often see, was my least favourite of the night. 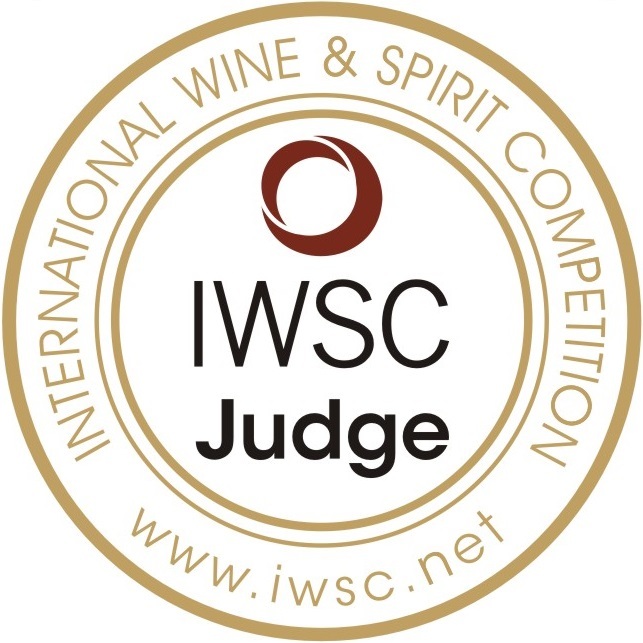 It is made with over 50% Grenache Blanc and a myriad of other varietals. It was simple and not appealing – there is no way I would spend 552 on this bottle. Fail. Domaine De La Mordorée Tavel AOC 2012 $42 This tied with the Hermitage for my second favourite of the evening. Great balance with nice acidity, strawberry and herbal notes on the palate. Made with 60% Grenache. Fantastic. Arnoux Trésor du Clocher Muscat de Beaume de Venise $34 This fortified, sweet wine is made with the Muscat grape and tastes like a perfectly ripe green grape. A bit sweet for my palate with 11% residual sugar. Domaine Du Vieux Lazaret Cuvée Exceptionnelle Châteauneuf-du-Pape AOC 2007 $60 A very nice, smooth blend of Grenache and Syrah in this wine…it presents a great balance with good length. I preferred the Hermitage from Northern Rhône to this but a very good wine, nonetheless. I enjoyed the wines from the Northern Rhône region over the Southern Rhône and the only one I was not at all keen on was the white Châteauneuf-du-Pape blend – not at all worth the money in my books. In 2009, David and I travelled through Provence and went up into Avignon. On my ‘must see’ list was Châteauneuf-du-Pape. I remember the sense of disappointment when we drove away – I don’t know what I was looking for but I know I didn’t find it! However – I didn’t know then what I know now and hope to head back to this area and go north up through the region and into Beaujolais at some point in the future. That is it for me for this week – I hope you are keeping healthy and well.